Ease pain and build strength! Ease pain and build strength! Get on the right path to better fitness and health. Order your copy of Easy Exercises: Walking today! Walking is a vital, yet underappreciated form of fitness. You learn to walk at a young age but as a wellness-building exercise, you may be surprised to learn that there’s more to walking than simply putting one foot in front of the other. Technique is key to make walking an effective form of exercise. This special report from the health experts at UCLA’s David Geffen School of Medicine will get you on the right path to better fitness and health. The benefits of walking regularly include weight loss, lowering high blood pressure, raising self-esteem, improving mental health, and more! Most importantly, walking is an easy gateway to regular exercise. And regular exercise is your prescription for living a long, happy life. There’s a lot to think about before starting a walking program, more than you might expect. Especially if you want to walk regularly with thoughtfulness and free of injury. You may ask yourself questions like, am I doing this right? What are the best shoes to wear? What’s the proper clothing to wear when the weather is hot or cold? Can I start a walking program if I have health issues like diabetes and cardiovascular disease? What’s the best way to stay safe while walking? This special report will answer all those questions and more. You’ll also learn that walking is more than just a way to get around. It’s a way to ease pain, build strength, and achieve wellness. The health experts at UCLA are eager to get you on that path. 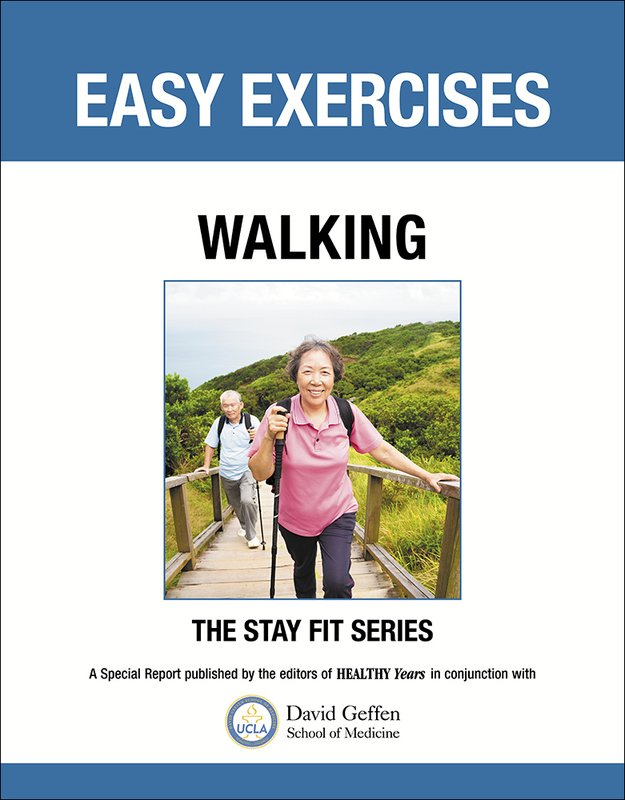 Order your copy of Easy Exercises: Walking today!